It's understandable, then, that he and other South Korean animators felt Banksy's montage wasn't fair to their cosmopolitan industry. Soon after the episode aired in the U.S. on Oct. 10 and in the U.K. on Oct. 21, YouTube videos of the sequence went viral online, prompting debate among bloggers. Marlow Riley of MTV's Clutch Blog called it a "ballsy critique," while Linda Holmes of the Monkey See blog at NPR lamented, "Nobody is advocating changing the way the show is produced." But in Seoul, 41-year-old Lee Hee-yang, a former colorist for The Simpsons during the 1990s, when wages were even lower and cartoons were crafted monotonously by hand, says she doesn't understand the sweatshop fuss. "Sometimes it was stressful. We worked until 2 a.m. on deadline days, but on most days it was a normal job," she says. Banksy declined to comment to TIME on the intended meaning of the couch gag. After first seeing the storyboard in mid-August, Shin says, he complained to Film Roman in California, arguing that the content was "excessive and offending." After some lobbying, the sequence was lightened  though, he says, not nearly as much as he had pushed for. He says the original storyboards, for example, showed animators wearing pointed Vietnamese hats, which were later replaced with more generic caps resembling those of postal workers. 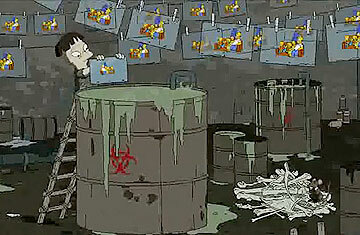 In an interview with Entertainment Weekly, Simpsons executive producer Al Jean claimed the sweatshop portrayal wasn't meant to be taken seriously. "I can tell you as a fact, there are no unicorns working in our DVD-production plant," he joked. Film Roman didn't respond to multiple inquiries for comment. Enslaved unicorns aside, some argue that the Banksy sequence's gray and forlorn atmosphere more accurately depicts the sweatshop-like conditions in the neighboring hermit state, North Korea. In the capital of Pyongyang, a state-run animation studio, SEK Studio, has been grinding away at many European and Chinese cartoons since 1997, when the group was founded. Guy Delisle, a French cartoonist, depicted its conditions in grim fashion in his 2004 graphic novel Pyongyang, telling the story of his work as a liaison between the North Korean contractor and a French animation studio. Shin, who was born in 1939 in what is today North Korea, says his company has worked with SEK, teaming up with the North Korean cartoonists on an animated fantasy film from 2006 called Empress Chung. Shin says he employed the North Korean company not to cut costs but to bring about cultural exchange between North and South at a time when inter-Korean relations were healthier. But Harvey Deneroff, a former correspondent for the industry journal Animatoon, says that in the past, Shin had been reluctant to reveal his relationship with the North Korean animators. "When I initially spoke to [Shin] about SEK, he did not want it known that he was having any dealings with them," Deneroff says. "He obviously changed his mind as the political climate in South Korea changed." Shin declined to comment as to whether his company has outsourced any other work to SEK outside of the partnership on Empress Chung. Since the release of Empress Chung, North-South relations have crumbled, and both the U.S. and the U.N. have imposed economic sanctions on the pariah state. But Felix Abt, the former head of the European Business Association in Pyongyang, a de facto chamber of commerce, claims SEK still has overseas clients, though he declines to name them. "Animation studios also have to protect customers' and their own interests with discretion," he says. So even if Banksy's gag was unfair to South Korean animators, a real-life model for his satire may still be alive and well  their neighbors to the north. See 10 things to do in Seoul.